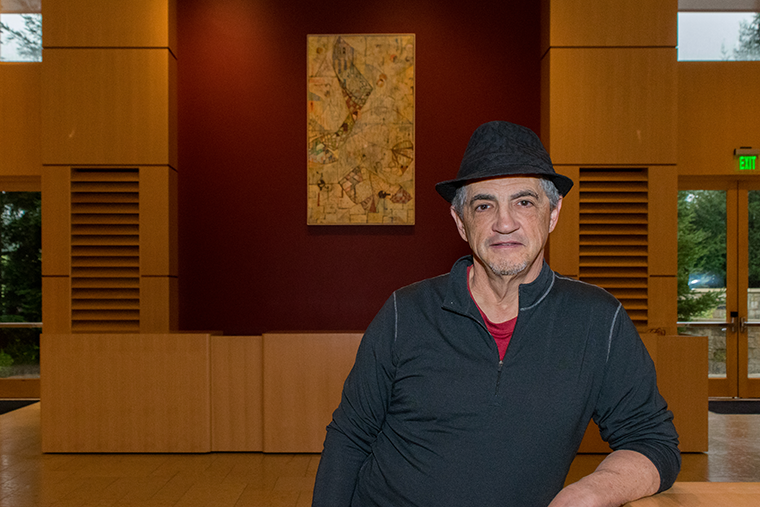 A new painting by Sonoma State University Professor Emeritus Mark Perlman is on display in the lobby of Weill Hall at the Green Music Center at Sonoma State University. "Tower 2" was donated to the University by Perlman, who started at Sonoma State in 1988 and taught for more than 25 years. The painting was made with the architecturally and sonically stunning Weill Hall in mind. "For this piece, I thought about how towers are built," says Perlman. "This painting has a sculptural context that relies on both the rational and irrational principals of architecture. Spatially, it's structured, but there's a certain kind of completion that needs to be done with the eye." The value of the piece is more than just a dollar amount, says Thaine Stearns, dean of the School of Arts and Humanities. "It's a significant piece of work by a significant artist," he says. "It's a pleasure to see the work of one of our own talented faculty members on display in Weill Hall at the Green Music Center." The large encaustic painting stands out against the bold, red wall on which it hangs above the wine bar in the lobby of Weill Hall at the Green Music Center. It is an abstract painting, but has a musical flow that evokes an emotion which can't be conveyed with speech. "Visual arts and music are a different language than words," says Perlman. Perlman's piece joins other paintings, photographs and sculptures already on display at the Green Music Center, including a painting by Jack Stuppin, large photographs of Christo's Running Fence and sculptures by Robert Ellison and Bruce Johnson, as well as a Breguet clock in the lobby of Weill Hall.